You can cook Turkey with hundreds of ways, there are flavor options everywhere you turn. Well, American Garden made things easier this time by getting you 5 Different Ways to Cook a Turkey. These are some of the most delicious, creative recipes you’ll have during the holidays! Put the turkey in the slow cooker with some vegetable soup and then wait for 8 hours. It’s considers one of the easiest ways to cook a Turkey if you have a busy day. Just brush it with some vegetable oil and then place the turkey on the cooking rack in your smoker, and let it be cooked for about 8-12 hours. 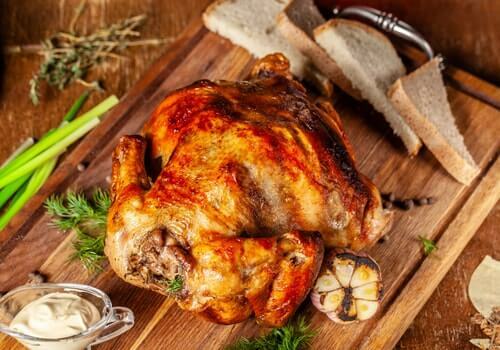 In a bowl, combine the mustard, herbs, salt, garlic, pepper, olive oil, and lemon juice to make a paste, Loosen the skin from the meat softly with your fingers and smear half of the paste directly on the meat, then Roast the turkey for 110 minutes to 120 minutes, until the skin is golden brown, you can serve it by BBQ Sauce from American Garden, It’ll taste more delicious. To braise a turkey, first, dissolve 1 cup salt and sugar in 2 gallons cold water in large container. Submerge turkey pieces in brine, cover, and refrigerate for 3 to 6 hours then put the turkey in oven after heating oven to 500 degrees then Remove turkey from oven, Brush turkey pieces with butter, reduce heat to 325 degrees, Cover roasting pan tightly with aluminum foil, Return covered roasting pan to oven and cook until breasts register 160 degrees and thighs register 175 degrees about 1¾ to 2¼ hours. Create a mix of cinnamon, clove, and nutmeg, then add brown sugar, salt, and pepper, then cover the turkey with canola oil and rub it in the spice, then sit it in the fridge overnight, then cook as usual. Try one of these ways and tell us what’s the taste? waiting for your Comment.